1.1These are the current rules for the GBPS Trading Forums. The GBPS Council would prefer to act in a "hands off" manner and let members get on with it, so we've tried to make the rules as flexible as possible -- they can be summarised as "use common sense and play fair with other members". In effect, this is the online equivalent of a public message board. 2.1The Society currently takes no commission on sales. This would have to change if things required a more "hands on" approach, but hopefully that won't be necessary! However, the Council may set more specific rules on any point if experience suggests they seem to be required. 2.2Please note that this facility is effectively a replacement for the packet service -- transactions via the forums are to be on a direct sale basis. In other words, this is not an auction site. 2.3Only current paid-up members of the GBPS may post in the trading forums to offer or acquire material. You will need to be logged in to the site with your usual username and password (if you don't have one yet, you will need to register first). Since they are GBPS forums, said material should at least be GB-related, or general items such as stockbooks and mounts. Other than that, you can list anything from single stamps and covers up to whole collections, and that can of course include things like postcards, ephemera, and so on. 2.4The GBPS acts purely as a facilitator to introduce buyers and sellers (or exchangers) to each other. We therefore make NO representation as to the quality or genuineness of the items offered, and members are responsible for the agreements they make -- the GBPS is not liable in the event of a dispute or loss. However, we do reserve the right to lock or delete topics without notice for any reason whatsoever at our sole discretion, and may do so if, for example, the rules are breached or an offer appears to be potentially problematic. 2.5Members making use of these forums are, by so doing, deemed to have fully agreed to these rules. Severe or persistent breaches of the rules may lead to a member being temporarily or permanently banned from using the trading forums, at the discretion of the GBPS Council. Please contact the website administrator in the first instance if problems arise (or if you are unsure how to use the forums). 3.1You offer material by creating a new "topic" in a forum, e.g. 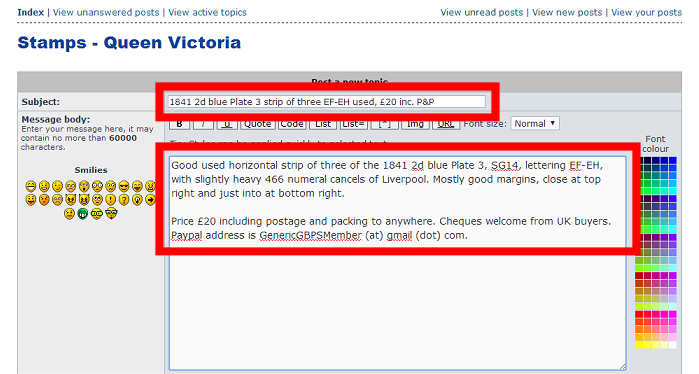 You'll see we have specific sales forums for various aspects of GB philately (stamps by reign, postal history etc) in order to help members find what they're looking for, so do create the topic in the most relevant forum. To keep things clear, please create a new topic for each offer, unless you are listing a number of essentially identical items (e.g. half a dozen special Stampex Post and Go strips). 3.2Offers should include pictures as part of the description -- members will want to see what they're buying! Generally speaking scans are clearer than digital camera photos, and should preferably be bigger than actual size to show the detail well -- 300dpi is a good general choice, and for single stamps or sets 600dpi is even better, especially for small details such as cylinder varieties. For most material, include a picture of the reverse too, as this is often important to judge condition or usage. Photos can however be useful when selling collections of everyday items that it doesn't make sense to scan individually. Any standard image type is acceptable, although the most useful types for philatelic pictures are JPG/JPEG and PNG. 3.3Hopefully this should go without saying, but ... items sold must be as described. In other words, they should be genuine examples of whatever they're stated to be, and if they have any faults not visible from the picture these should be clearly stated in the description. Breach of this rule is grounds for return of the item for a refund at the seller's expense. If you're really not sure whether an item is OK, either offer it subject to certification if appropriate, or state "SOLD AS IS" prominently in the description. 3.4State any postage, packing or other charges clearly. Remember that the GBPS has members all over the world, so unless you're only willing to post to local buyers, you should give an indication of overseas charges too. For the same reason, try to offer some method for overseas buyers to pay easily (such as Paypal or Skrill). There's no requirement to use any particular method, but if you can only accept payment by (say) bank transfer in Euros, you'll be severely limiting the number of potential buyers. Since a majority of GBPS members are in the UK, however, pricing and payment in pounds sterling is generally a sound idea. 3.5Don't swamp the forums by listing everything you have all at once -- if you have a few dozen items to sell, space them out. Do price them reasonably -- Ian Harvey's suggestions in the context of the packet in Newsletter 327 seem relevant here. Material should be of reasonable quality -- the minimum price for a sales listing is £5. Doesn't hurt to leave the picture/price in place though -- it gives people an idea of what sells and for how much. 3.8Anything offered on the GBPS sales forums must be exclusively available to members for a period of one month -- i.e. don't list it on eBay, Delcampe, Stampboards etc at the same time. If it's still unsold after a month, then feel free to put it up for sale elsewhere too, but if it sells somewhere else please come back and edit the topic title as above. The first person to make such a post on the topic gets it, and the seller is required to sell it to them at the stated price (even if someone else comes along and offers more). The post can just say "sold" if you think someone else might get in while you're typing. You can of course ask questions before purchasing, but if someone else posts "sold" to the topic before you, the item is theirs. 4.2Once something is sold, it's up to the buyer and seller to arrange payment and delivery in the most mutually convenient manner, but this should be done as quickly as possible. If the seller hasn't been paid within a week, they may re-offer the item if they wish. 5.1The "Wants" forum is very straightforward. Simply post the details of what you're looking for in a new topic, and hope that someone has it and offers it to you at the right price. Again, if you don't get an offer please don't "bump" the topic more than once every few months. 5.2If you're looking to exchange material rather than buy or sell direct, then make a post in the "Swaps" forum stating clearly what you have and what you would like to exchange it for. Obviously in this case you have to take pot luck on someone wanting to swap what you want for what you have. 5.3If you have items that you're willing to pass on free of charge (perhaps simply to make a bit of space! ), or for just the cost of postage/shipping, then make a post in the "Giveaways" forum. The rules above, where relevant, apply here too -- in particular "first claim wins".